The Internet has revolutionized the way we communicate and do business. In this new century, the World Wide Web has become the standard source for information on businesses, people and any of a variety of subjects. It has thus become imperitive for businesses and individuals to establish and maintain an online presence allowing people to connect with them easily and effectively. A web site can fulfill a variety of needs. It acts as a world-wide post office box, allowing people to find and communicate with you quickly. It is your electronic storefront, showing potential customers your goods and giving them more information about the services you provide. It is an online sounding board, allowing you to share your views and opinions with people throughout the world. 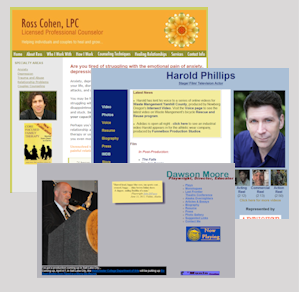 Munin has years of experience building and maintaining both personal and business web sites - click here to see just a few examples. We focus on creating content-oriented sites with easy navigational tools and a unified look and feel. We also work to integrate your internet marketing strategy with existing and future marketing tools, allowing you and your business to put forth a unified message. We offer a wide range of design and graphic manipulation services at reasonable rates calculated to meet your needs. Because they are largely under-represented on the internet, Munin gives special consideration to the artistic community as part of its mission to raise its visibility around the globe. The Internet is the world's largest directory of services and information. Shouldn't you make your mark in this rapidly expanding territory? Contacting us now can seal your future in this exciting new medium.